Tournament fishing since 2004. I have been blessed with a husband, Dewey, that is my partner and main supporter. We are active, enthusiastic tournament competitors who support catch-and-release fishing, and are committed to preservation and conservation of our natural resources. We have had an amazing time traveling, fishing and meeting new friends. 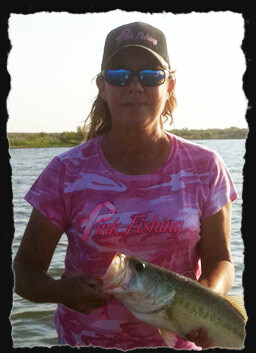 Pro Staff Director Pink Fishing, Team Pink Fishing. Other sponsors include Kistler Rods Elite Team, El Grande Lures, Andy’s Custom Bass Lures, The Rod Glove, Tuff Skinz Motor Covers, and FINS Fishing. Still Waters Bass Club, Texas Bass Couples, Haskell Bass Club, Big Country Fishing, and any open tournaments we can fit into our schedule. 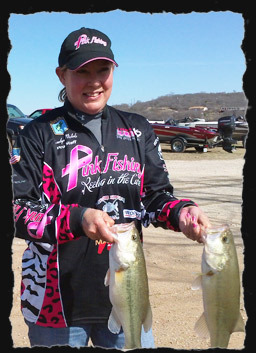 2008 – 1st place Women’s Division Lonestar Radio, Open Tournament, Lake O.H. Ivie, Texas. Angler’s Legacy Ambassador, Lifetime member of BASS, Member of ABA, Still Waters Bass Club, Tournament Director Haskell Bass Club, Tournament Director Big Country Fishing, Tournament Director Camp Able Benefit Tournament. Yearly participation as Captain in C.A.S.T. for Kids, Kid’s Fish Days, TPWD Kid’s Fish. Active Committee Member for SurvivorFest, Staff Member Bunco for Cancer, Participant Cancer Services Network’s Run Together for those who fight, fought, and hope. O H Ivie, Miller’s Creek, Allan Henry, Hubbard Creek, Possum Kingdom, Oak Creek, Sweetwater, Nasworthy, and others throughout Texas. Favorite lake is Amistad. My aspiration is to share my experience, knowledge & the love of the outdoors with others. Pink Fishing has given me this opportunity to promote not only their high quality clothing, but also has allowed me to achieve something even greater. 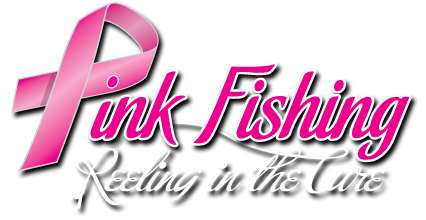 Through their yearly donations to breast cancer research, Pink Fishing has dedicated themselves to promoting awareness of breast cancer and empowering women with tools for early detection. EARLY DETECTION IS KEY TO BEATING BREAST CANCER! We truly are “Reeling in the Cure, one shirt or hat at a time”.